Suspects being led into the Harare Magistrate's Courts. SIXTY more people have appeared in court for taking part in protests that saw property destroyed in Harare, especially on Monday and Tuesday. 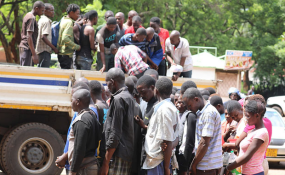 Marrian Vhurandi (39), Shadreck Sasamba (37), Morrosi Carnange (22), Enerst Maketo (29), Tafadzwa Chamunorwa (20) and 55 others appeared before Harare magistrate Mr Francis Mapfumo yesterday charged with public violence. They denied the charges through their lawyer Mr Kossam Ncube. The prosecution, led by Mr Progress Maringamoyo, opposed bail. He said the suspects were facing serious charges. The suspects allegedly attacked Epworth police station and barricaded Chiremba Road, denying motorists and commuters access to the city. State witness Peter Mangwende, who is the officer in charge of Epworth police, told the court some of the suspects were of no fixed aboard and giving them bail might see them fleeing justice. Mr Mapfumo remanded the 60 suspects in custody to today for continuation of bail application. It is alleged that on Monday, the suspects and their accomplices who are still at large connived to carry out acts of violence in Epworth. They barricaded Chiremba Road with burning tyres. They also stoned Epworth Police Station and motorists driving along Chiremba Road. The court heard that they also threatened to set Epworth Police Station on fire. The trial of eight other protesters who burnt a Zupco bus along the Harare-Bulawayo Highway near Kuwadzana in Harare continued yesterday. An attempt by the suspects' lawyers to stop the trial failed. The lawyers claimed they were not served with State papers.